Alex S. Jones, the director of the Shorenstein Center on Media, Politics, and Public Policy, moderates the annual Goldsmith Awards in Political Journalism celebrating works that encourage improved debate about public service and government. Jones, who will retire in July, moderated the awards for the last time as the director of the Shorenstein Center. The Shorenstein Center on Media, Politics, and Public Policy awarded the Goldsmith Prize for Investigative Reporting to journalists from the Miami Herald for their series titled “Innocents Lost” on Tuesday night. The other journalists that were finalists for the award were also honored for their contributions to the field. The event seeks to honor journalists who promote “effective and ethical conduct of government” by exposing both corrupt and commendable government performance. Finalists are awarded $10,000, and $25,000 is awarded to the winner. “Each year the Goldsmith Prizes are an inspiration to all journalists, and this is a banner year for inspiration,” said Alex S. Jones, director of the Shorenstein Center, during the welcoming remarks. After 15 years of serving as the director of the Shorenstein Center, Jones is set to step down from his position on July 1. “Innocents Lost” is a series published by the Miami Herald that documents the deaths of nearly 500 children in Florida and examines the Florida Department of Children and Families’ accountability for these deaths. This investigation led to changes in Florida’s child-welfare laws. Carol Marbin Miller and Audra D.S. Burch, two of the co-authors of the series, were present Tuesday night to receive the award. “The [Miami Herald’s] stories and the database put a human face to those children. And it rocked Florida,’’ Jones said. 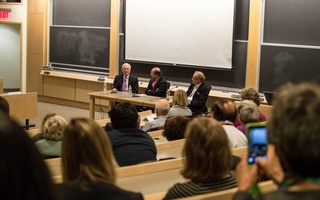 Marvin Kalb, founding director of the Shorenstein Center and veteran reporter for CBS News and NBC News, was awarded with the Goldsmith Career Award for Excellence in Journalism at the event. Kalb spoke highly of those being recognized for journalistic integrity. He was critical, however, of some modern journalistic trends. 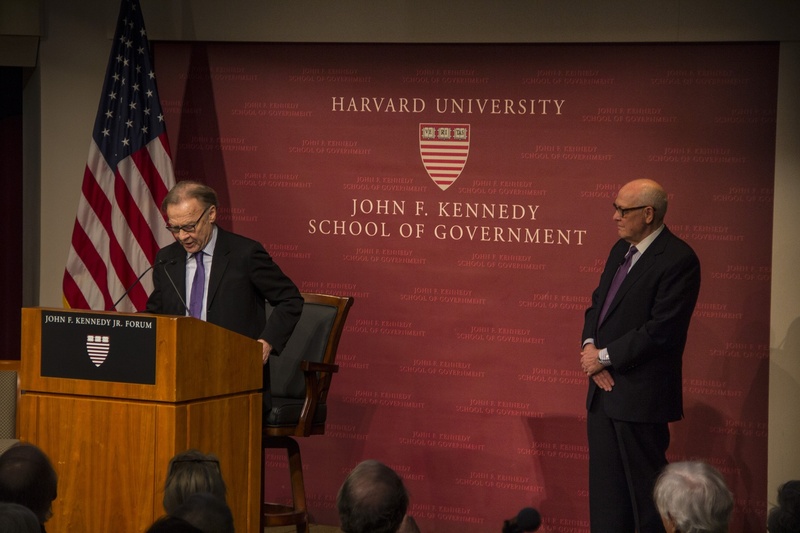 Professor of Government Thomas E. Patterson, left, presents the Goldsmith Book Prizes for best academic and trade book as Alex S. Jones, right, looks on. 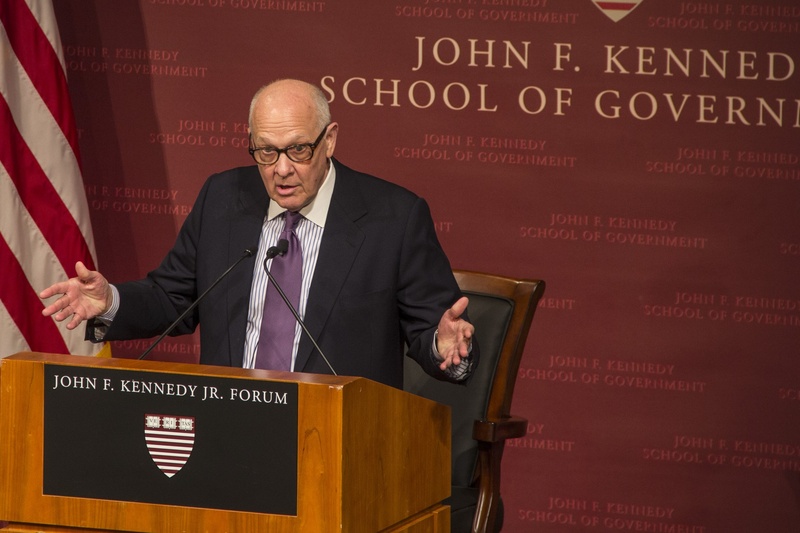 Thomas E. Patterson, professor at the Kennedy School, awarded the Goldsmith Book Prize to Daniela Stockmann’s Media Commercialization and Authoritarian Rule in China and Andrew Pettegree’s The Invention of News: How the World Came to Know about Itself. The other finalists for the Goldsmith Prize for Investigative Journalism included reporters from the Boston Globe, the Post and Courier, National Public Radio and ProPublica, Reuters, and the Wall Street Journal.